Pink Lemonade: Preview Emily Osment's New Album a Week Early! Preview Emily Osment's New Album a Week Early! 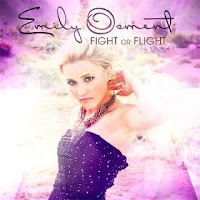 Fight or Flight - the new album from Emily Osment - hits stores next week on October 5th, but fans can preview the album this week exclusively on JSYK.com. Fight or Flight features her electro-pop single "Lovesick," currently available only on Verizon Wireless. Grab your phone and go to the VCast store to download the MP3, and visit VZW Tones > What's New to get "Lovesick" as ringtone or ringback tone (buy online). Pre-orders for Fight or Flight are still available on Emily's website, OfficialEmilyOsment.com. Fans can choose just the CD, a CD with an exclusive pre-order t-shirt, or the Super Fan Pack, which includes the pre-order t-shirt, a personalized voicemail greeting recorded by Emily and a personal phone call from Emily herself. For all the latest news and updates, stay tuned to the website or her Facebook page, where she has also launched a new Back to School Quiz. Visit the Quiz tab to answer a series of questions about Emily, win badges and challenge Friends.